Didn't get a chance to post my card for Mojo Monday yesterday, so here it is. I actually kept it quite simple since I didn't start working on it until late in the afternoon. I'm also using this for my entry into the Color Throwdown from this past week. I'm a bit behind on that, I'm afraid. I have been trying to switch from SU papers to PTI paper and as such I don't have any of the new colors, so I used the ones I could match most closely. I chose, Kraft, Pure Poppy, Blueberry Sky and Orange Zest. 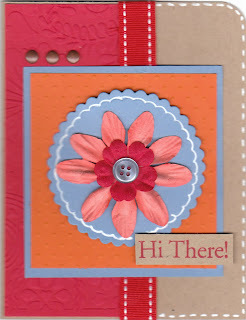 I also decided to use some flowers as my focal image, instead of stamping. 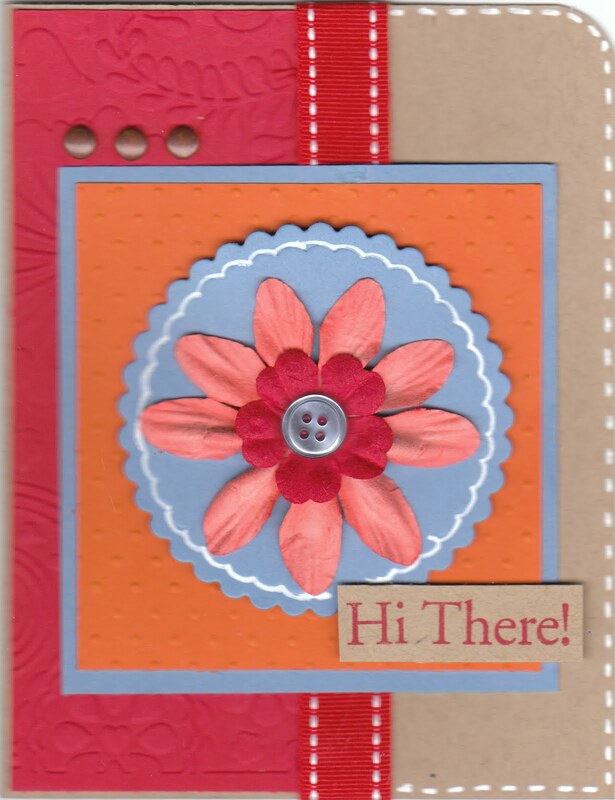 For this week, I am going to be focusing on embossing, and today I used 2 Cuttlebug embossing folders, Floral Fantasy and Swiss Dots. I opted to leave out the bow at the top of the square because I thought it just competed too much with the flowers in the middle. The card is very simple and came together quickly. I hope you like it! Very pretty! I love the touches of white with the stitches in the ribbon and the faux stitching! Thanks for joining us for the Color Throwdown!